In the future, after global warming, Earth is covered by ice and snow in an Ice Age. The survivors live in facilities underground named Colonies. 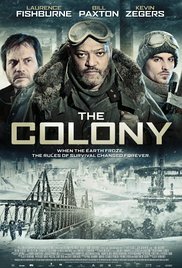 When people from Colony 5 release a distress signal, the leader of Colony 7 Briggs organizes an expedition with Sam and Graydon to investigate what has happened to their acquaintances. Briggs leaves the scientist Kai in charge of the group, disappointing his former friend Mason that expected to be assigned to the position. They walk for two days to reach the facility where fifty persons live and they find only one survivor that is scared to death locked in a room. Soon they learn that a savage group of cannibals have slaughtered the colonists. A poor unimaginative movie for in between. It was a mix of “The Day after tomorrow” and “I’m Legend“. The moment they enter the other base was exciting, and that’s about it. A very predictable movie with bad CGI and substandard performances. Laurence Fishburne was enjoyable. Bill Paxton was a disappointment. And Kevin Zegers a pathetic hero. The final fight was unbelievable and ugly portrayed. The ending was so implausible. To reach the other base, they had to stay in a helicopter because it’s stone freezing cold at night. But they do go to the promised land in almost summer clothes. And when you look at the final scene, it’s still a long way to go. Strange !